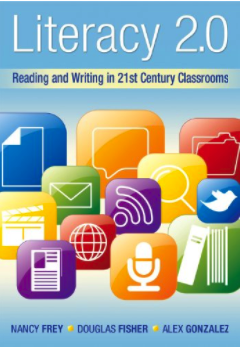 The book we picked out for you for this week is authored by Nancy Frey and Douglas Fisher and titled "Literacy 2.0: Reading and Writing in 21st Century Classrooms". In this work, Fisher and Frey, authors of the popular Teach Students to Read Like Detectives, approach the concept of literacy in the light of the recent developments in the world of technology and digital media. Literacy 2.0 is an incarnation of the pervasive ethos of what is known as web 2.0 or what Tim O'Reilly called the social web. literacy 2.0, as the authors argue, is not a 'departure from literacy 1.0 nor is it a replacement of it; literacy 2.0 represents a shift, one that is built on and extends the major notions embedded in literacy 1.0.